Listen to a radio story about the jazz funeral for Harold Dejan, produced by Matt Sakakeeny for American Routes in 2002. Harold Dejan was the bandleader and saxophone player with the Olympia Brass Band. Under “Duke” Dejan’s leadership, the Olympia became one of the most prominent bands in New Orleans during the 1960s and 1970s. The Olympia became known for their modern repertoire and dress, and for playing high-profile shows outside of New Orleans. 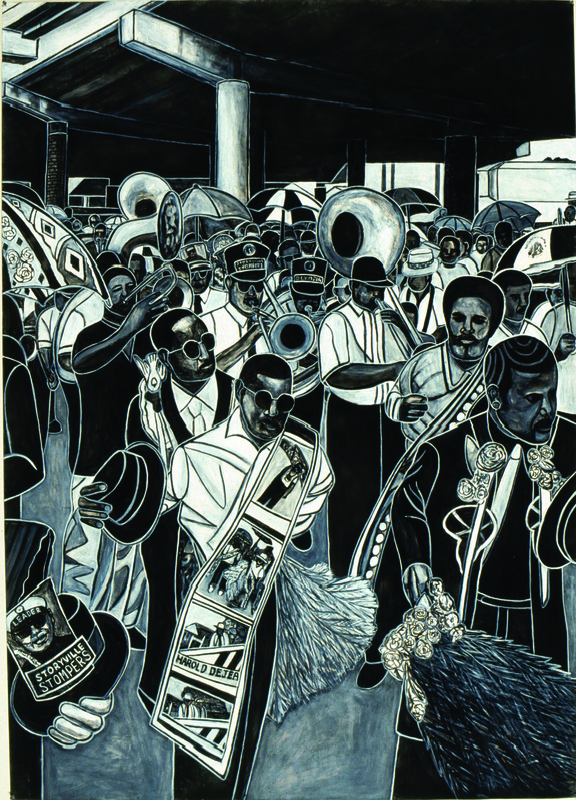 The Olympia was accompanied by a host of musicians from around New Orleans who played as the parade wound through New Orleans’ Treme neighborhood. As the parade moved through the neighborhood, the musicians played traditional hymns until the parade reached the intersection of Esplanade and Claiborne. There Dejan was “cut loose”: close friends and family accompanied his casket to the cemetery, while the musicians and those in the second line continued along the parade route. After burial, the musicians shifted from slow, mournful tunes to more celebratory, up-tempo repertoire, beginning with Anthony “Tuba Fats” singing “Didn’t He Ramble,” leading the second line out of the cemetery. Artist Willie Birch, who created the artwork in the book Roll With It, was also at the funeral and created this piece called “Sweet Bye and Bye” that adorns the cover of the book. “Sweet Bye and Bye,” Willie Birch, 2002.